During the winter of 2008, JR Larson decided to make the most of the frigid Canadian winter and invented a technique for making artworks out of ice. Vintage, industrial windows were propped in various outdoor locations in order to collect and manipulate ice formations. The artist monitored weather patterns and coordinated his sessions with the extreme rise and fall of temperature. He then used a torch to melt selective areas. 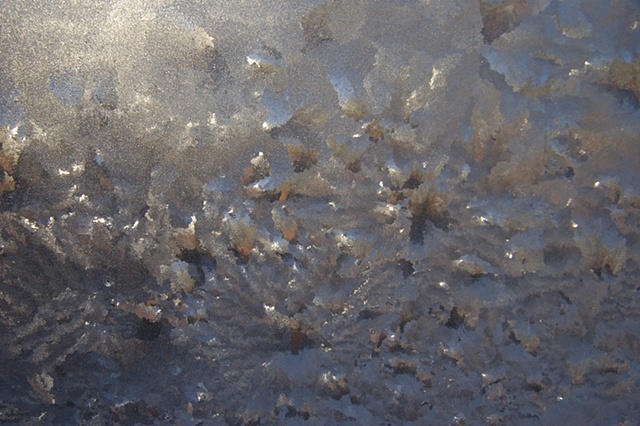 As the ice refroze, it formed different crystal patterns depending on the temperature. In this way, the artist was able to combine crystal patterns that would not normally co-exist in nature to form elegant ice pastiches. This work is was photographed during the “golden hour” of sunrise and sunset giving them a warm hue. In addition he utilizes the colors and structures of the surrounding urban landscape to contrast and playfully reinforce the hands on relationship we have with our natural surroundings.